Game one of the day against collegiate side Cal State-Fullerton featured a side of mostly reserves and academy players for Atlanta United, although Darlington Nagbe and Tito Villalba both featured for half of the match. Atlanta began the match in a 3-4-2-1 formation, with new signing Brandon Moore in goal. There were a couple of big surprises in the back, with a center-back trio of Mikey Ambrose, Kendall Edwards and Jon Gallagher starting the match. Edwards is a seventeen-year-old from the Atlanta United Academy, and the only natural center-back amongst the trio. Mikey Ambrose is a natural outside-back, whilst Gallagher has played most of his career to this point as a striker. The midfield featured a pairing of Darlington Nagbe and Amir Bashti, flanked by George Bello and Gordan Wild on the left and right wings respectively. Up top, Romario Williams played in the role of striker, whilst Andrew Carleton and Brandon Vazquez played as attacking midfielders underneath him. The first half of the match played out without a goal, although it was not without its chances. Romario Williams had four shots saved in the first half, including a shot that beat the goalkeeper but was cleared off the line by a defender. 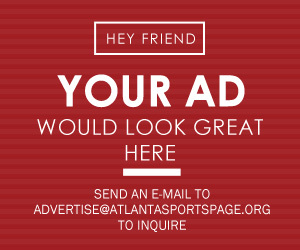 Andrew Carleton was decidedly the catalyst for Atlanta United, but wasn’t quite able to coax a goal out of his teammates. The midfield pairing of Bashti and Nagbe failed to really generate chances for the players further up the field, with Nagbe looking a bit rusty on the ball, and Bashti simply looking out of his element for large portions of the first half. Halftime saw three changes to the side, with Vazquez, Gallagher and Nagbe coming off for Tito Villalba, Dion Pereira and Anderson Asiedu. Tito and Asiedu were straight swaps for Vazquez and Nagbe respectively, with Pereira coming in on the left wing pushing Bello back into the left-center-back position. The subs brought a lot of stability and confidence to the team, which culminated in the games first and only goal in the forty-second minute. Carleton finally saw his creative work pay off as he dribbled through the midfield before playing Romario Williams in behind the defense. Williams was finally able to beat the Cal State goalkeeper with a calm finish to put Atlanta into the lead. Although there were no other goals in the match, it was not without its chances. Dion Pereira looked especially dangerous operating on the left wing and created several good chances, but the Cal State goalkeeper was determined not to be beaten again on the day, making a number of extraordinary saves to keep the match at 1-0. Asiedu also put in a very solid performance in the 40 minutes he played, and his introduction as a more defensive midfielder gave a lot of confidence to Bashti, who was able to push further up the pitch and played much better in the second half. However, Kendall Edwards was easily the biggest surprise of the day, as he played an incredibly solid match as the only recognized center-back for Atlanta. He saved the other defenders on multiple occasions and refused to be beaten throughout the day. The second match of the day featured much more of a first-choice squad facing up against a Club Tijuana squad comprised mostly of their U-20s with a few first teamers sprinkled in. Notably absent were Kevin Kratz, Florentin Pogba, and Darlington Nagbe. Kratz has missed every match so far in the preseason after picking up a slight injury last week, while Pogba is not yet match fit, having not played a match in over six months since becoming a free agent. Nagbe was expected not to play, having been involved in the first half of the match for the reserves. Like the Academy team, the first-teamers began the match in a 3-4-2-1. Brad Guzan started in goal, with Michael Parkhurst, Miles Robinson, and Leandro Gonzalez-Pirez forming a bank of three in front of him. The midfield featured Brek Shea and Julian Gressel on the wings, with Jeff Larentowicz and Eric Remedi playing in the middle. Josef Martínez featured as the main striker, with Ezequiel Barco and Tito Villalba playing behind him. Unlike the reserves match, it didn’t take long for the first team to find a goal. Pressure from Barco high up the pitch created a turnover, and he and Josef combined to beat the Tijuana defenses leading to Josef tapping in the opening goal after just six minutes. A few minutes later, Ezequiel Barco looked to have doubled the lead after chipping the keeper, but he was called offside. Following the offside from Barco, Tijuana looked to take control of the match and managed to do so for a couple of minutes, pressing Atlanta and not letting them play out from the back. However, in the 16th minute, a ball over the top forced the Tijuana goalkeeper to come far out of his box to attempt a clearance. The attempt at a clearance fell at the feet of Josef Martínez, and after a quick one-two passing sequence with Tito Villalba, Josef chipped the ball over the keeper and the rest of the Tijuana defense into the goal for the 2-0 lead. Just three minutes later, Josef and Tito would combine again, this time leading to a goal from Tito from about eight yards out. Around the twenty minute mark, the Club Tijuana goalkeeper was forced to leave the match with what appeared to be a strained quad. Following that, Atlanta seemed to sit back in defense, content to simply repel the Club Tijuana attack. However, in the twenty-eighth minute Tijuana put together a slick sequence of passes, culminating in a tap in at the back post for striker Cubo Torres. The response from the trailing team would be the last significant action of the first half. The second half saw only two changes for Atlanta United. Brad Guzan was withdrawn for Alec Kann, and Tito Villalba made way for new designated-player Pity Martínez. The introduction of Pity marked a definitive change in the way the front three operated, with he and Ezequiel Barco roaming all around the midfield to look for space to play in. And it didn’t take long for that shift to pay off. 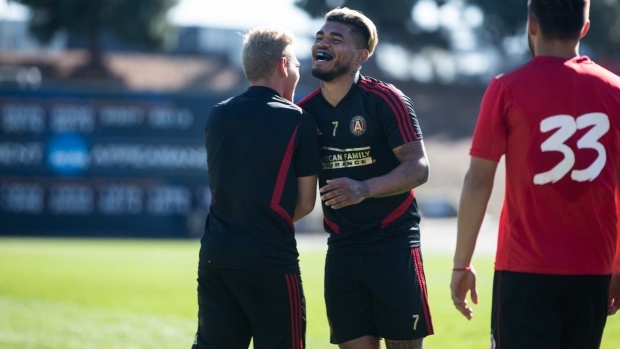 In the forty-second minute the Atlanta United attack moved the ball skillfully through the Tijuana defense, passing the ball around the six-yard box three times before Josef Martínez smashed the ball into the net to complete his hat-trick. Ten minutes later, Barco would play Josef through clean on goal, before Josef found Barco streaking into space for a tap in into the open net. The final goal of the day came as the result of a free kick drawn by Ezequiel Barco. Although this was the only one to pay off, both he and Pity Martínez drew several free kicks each in the second half. This one, delivered from the left wing, was played into the danger-area by Pity and found none other than Josef Martínez for his fourth goal of the day, this one a powerful header. Although the match ended 6-1, Atlanta could have easily made it more. Julian Gressel alone wasted two glorious opportunities to extend the lead, although neither were easy chances by any stretch of the imagination. The team looked very comfortable in the 3-4-2-1 formation today, and it wouldn’t be surprising to see this end up being the formation deployed by Frank de Boer in the opening round of the CONCACAF Champions League in two weeks time. The formation allows for creative players like Barco and Pity Martínez to play to their strengths, while also creating a strong defensive presence. It also allows for the kind of total football that Frank de Boer deployed to so much success at Ajax, and fits the pool of players we have well. Finally, while the 6-1 result today and the 7-1 result Saturday are sure to have some fans excited at the prospect of the new season, it is important to take into context the squads we’ve faced in those two matches. Seattle put out a mixed team of mostly reserves with a couple fringe starters just looking to get match fitness. Club Tijuana is in the middle of their season and sent their U-20 reserve team with a few starters to give their youngsters some experience. While it’s good that the team is playing so well together, it won’t be until the first competitive match until we see what they’re truly capable of.